I have been training the wrong way for the last 3000 miles. I am the type that just can't stand going slow. Problem is, when it comes to cycling, you have to go slow in order to go fast. If you go fast from the get go, you never get the most out of your muscles. Then by the end of the season, you are running out of power while those who started slow are just coming into theirs. Here is how I'm told it works. You go slow for longer distances to slowly bring all of your muscles into play. The capillaries begin to spread and attach to the muscles that have not been used as much and this helps get oxygen to your body. This is important when you start going hard. You'll need that oxygen! If you just hop on and go hard, the body tries to work with what it has. It tries to feed fewer muscles and those muscles get overworked. Overworked muscles are unhappy muscles. Unhappy muscles equal unhappy cyclists. So, even though it is a little late to change my ways, I have started a plan to do more interval training rides. This is where you go easy for a set time or distance and then go hard for a set time or distance. I was happy to see that on my hard laps (the red ones), I was able to stay under 7 minutes per lap. I also was able to nearly match my last hard lap to my first - only 4 seconds off. That last lap was actually not part of the training. I did a lap with some other cyclists. The result of this was that I felt like my legs got an even better workout than when I push for an hour. By the way, my average speed was 17.2 mph for 1:26. Even though I felt my legs got a good workout, I recovered much faster. I really think this is going to help. My plan is to do this most Tuesday or Monday evenings. Thursday evenings are for my climbing training. I'll do intervals there as well, but they will be up Paris Mountain. This Thursday, my plan is to do five "laps" which should give me about 20 miles. The Tour De France finished up yesterday with the almost boring ride into Paris. With only 31 seconds separating third from first, you kind of hoped there would be some run for time bonuses. Oh, well, TRADITION! The NASCAR boys were back in action after a week off. They ran in the tradition rich confines of the the Brickyard. I didn't get to see the end of the race, but I was glad to see Gordon came home in third. He continues to add to his points lead - and I keep adding to my lead in the fantasy league! I still maintain six race lead over BBuck. DraftingWithYates has moved into a tie for second place with BBuck. Both of those teams have really started coming on toward the end of the season. Last night just before going to ball game, I connected with Precise Imprintable Products and picked up my Ride for Mike jersey. We were rushing to get it done by Friday evening so that I could have it this morning when I was to be presented a George Hincapie autographed jersey before the Sunshine Cycle Shop ride. I woke up to find it raining. Oops. Not sure we would ride, but I knew someone was going to be coming to the shop to present the jersey. So I loaded up the bike on my car and drove over. No one was there. As I started to drive away, Art (a Saturday morning regular) pulled up. We decided to wait and see if anyone else would show up. That is when Kevin showed up with the jersey. 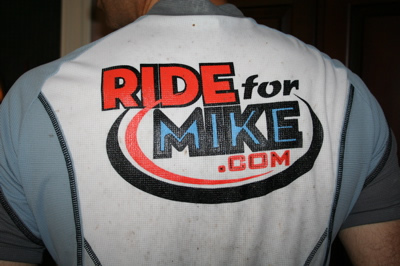 We talked a little bit about Mike and the P3 ride. Since no one else was there, he went ahead and took a picture of me with the Hincapie jersey and went on his way. Shortly after, Tyler (a shop employee) showed up with his mother and the four of us rode an abbreviated course in the rain. Got home and turned on the TV to check out the time trial of the Tour De France. What a finish! I'm so glad I was able to see it. Levi turned on the afterburner and to have just around 30 seconds between the yellow and third place is amazing after thousands of miles is amazing! Just crossing my fingers on the doping stuff. There is a rumor that another rider has tested positive. 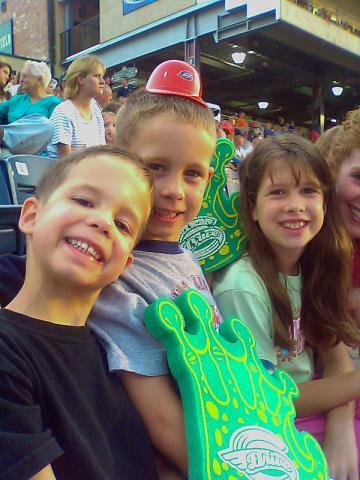 We had lots of fun at the Drive game tonight. Josiah especially fell in love with Wally the Green Monster. He was the visiting Red Sox mascot. The little guy got to spend some quality time with the hairy green fellow. This is the picture we sent to the jumbo screen for the 8th inning Drive Vision Shots of the Game. The Drive lost, but a good time was still had by all - even if John McCain was visiting the ball park. The fireworks made up for anything else! I got home from work today to find a yellow Tour De France hat that might brother-in-law brought me from Paris. I looked at it and it felt anti-climatic. I had looked forward to getting it, but now I wondered if I would ever wear it. It has not been a good week or so for cycling fans. All of the doping scandals made my bright yellow hat seem a little dull. Still, it is a cool hat and I'm sure it will help keep my bald head from getting sunburned. I put up my hat and headed to the evening meeting at my church. Upon returning home around 9 PM, I turned on the TV to see a BREAKING NEWS banner going across the bottom. It was telling us that Michael Rasmussen had been removed from the Tour by his Rabobank team. Whoa - that I didn't expect. I was pretty bummed that Rasmussen held off the Disco boys. I had hoped today that Contador would tighten the screws and crack the Dane. I wanted Rasmussen out, but not from being withdrawn - but by getting beat! We can only hope that this will be the Tour De Changement. Is it too much to hope that this will be the beginning of reformation in the sport? These riders have almost brought the Tour De France - and cycling - to its knees. I get kind of tired reading the Tour coverage in The Greenville News. They always want to give us an update on George Hincapie, but they don't seem to know what they are talking about. They only seem to think in terms of the yellow-jersey. "Hincapie looses two spots." "Hincapie gains two spots." I hate to tell them, but this experienced rider is not there to hold a high spot in the general classification. What he is supposed to do is exactly what he did today. He got in the lead group to take a position in the front and then he sacrificed himself to put the hammer down to control the breakaway. Then he fell back to pick up Contador and Levi. Big George was clearing the way! I thought he was going to go and ride away from his teammates! What he did was deliver Contador with some fresh legs to extend time on the other GC riders (except Rassmusen). Hincapie can sleep well. He did his job and he shares in Contador's success. Everyone in the peloton knows he is one of the best lieutenants ever. I was sad to hear that Fast Freddie had to drop out of the Tour. We don't have a lot of American's left! I don't see Levi, George, or Chris Horner dropping out. Michael Rasmussen still holds the Yellow Jersey and the Tour appears to be headed for the uncertainty of another doping scandal. Only a few more days to see the jersey pass to another rider. I respect the fight Rasmussen has put up to retain the leader's jersey, but I certainly don't want to see the Tour have to face another year like last year. Being American, I follow closely the Disco boys. As a Specialized rider, keep my eyes on the QuickStep Innergetic team with their rock star leader, Tom Boonan. Don't think the QSI team has a chance at the Yellow, but Alberto Contador with Discovery Channel appears to be one of the best chances to take Rasmussen and doping off of the headlines. I guess at this point, I'll be pulling for the Russian and hoping that Levi will pull off an outside miracle. Of course, it would have been the story of the Tour had Alexander Vinokourov been able to back up his time trial effort from yesterday. Now, he is nothing more than a memory. In a week, the whole race will be a memory. How long will we have the doping cloud remain? I got up this morning to join David "Locomotive" McQuaid for a couple of laps of the USA Cycling Pro Championship Road Race course. We both plan to participate in the ride on Labor Day weekend. The goal is to do as many laps as you can in four hours. We figured we needed to get out there and get a feel for what it would take. We've done a lap of the course before and I think we have done two before, but I can't remember. Anyway, going out there again today definitely showed us what we need to do! We covered 2 laps - about 44 miles in 2:49 of seat time. If you count the time we spent at stop lights and waiting for Chris Hartzler and his brother-in-law, it took us over three hours. I felt bad about leaving Chris and Bruce. I'm certain Chris could have kept up with his, but his brother-in-law is just beginning to pick up riding. So, he was only able to hang with us until we reached the bottom of Paris Mountain. Chris connected with us at the top and told McQuaid and me to go on. I think they ended up completing one lap. Here is a link to my upload from my Edge 305 to Motionbased account. The most relevant portion of the report is the elevation graph. Two climbs of over 1000 ft in just a couple of miles. The big problem for me is that once I finished, I crashed -- not on the bike, but my body. I thought I would be fine as I had a chance to eat within the first 30 minutes after the ride. However, I ended up just dragging myself around and ended up dragging myself right into bed where I slept pretty solid for an hour. It wasn't until shortly before I started typing this that I felt like I was getting back in shape. Why? Sure, the climbing was part of it. However, I think it was the way I did the climbing. My first time up I came across the remnants of the Carolina Triathlon shop ride. Of course, that is a carrot and I wanted to pass them all. I did, but my HR spiked at 192 bpm. That push combined with the rest of the ride must have done something to me. I felt better on the second climb because I didn't push myself. Bottom line is that I've got a lot of work to do before September! I don't feel good. Maybe it is because I'm seeing the cardiovascular power of those Tour De France riders! When they are tooling along at 100 bpm, my heart would be banging away at 160 to 170 bpm. I have not had a regular training routine in several weeks. This week I was off the bike Sunday through Tuesday because of my Grandfather's funeral. Tuesday I managed to get on the trainer (I've converted my ProFlex 757 into a stationary bike) and put in about 20 miles. I did the same on Wednesday evening. I couldn't wait to get back on the road! What I found was that I am not nearly as in shape as I was before my surgery. Before the break, I really had to work hard to get my heart rate into 180s. The last two times out I have hit a max of 191 bpm. I can power up a climb over 20 mph, but then I feel like puking at the top as my HR soars. I guess I just need to get back in the saddle and build my base miles up again. By the way, on my ride tonight, I crossed the 3000 mile mark since last August. I'm typing this while watching the TDF. They were just talking about Hincapie just a few moments ago. Old Bob doesn't even know how to say "South Carolina." He calls it "Southern California." Then they have the audacity to think we don't know how to say, "Pla d'Adet." Who has trouble saying things? Either way, I enjoy watching the Tour da frantz. Last Saturday after climbing Nature Trail - a part of the Sunshine Cycle Shop ride that I hate - I was wheeling slowly back toward the shop ahead of the group. Soon I heard someone ride up behind me. It was Mike, the owner of the shop who joined us that day. We rode back together and he started to tell me about Floyd Landis' new book. He said that regardless of the doping aspect of the Landis story, it was a good read and he thought I would enjoy it. Taking his word for it, I drove over to Barnes and Noble later that day and picked up, "Positively False: The Real Story of How I Won the Tour de France." I'll be honest. I had not been following the Landis case that much. It isn't that I'm not interested. I just am afraid of what I will find. I was pleased to have Floyd win the Tour and couldn't believe that he would have been stupid enough to take a drug the day of his great comeback. He would have known that if he did win, he would have to get tested. Not wanting to believe it, I didn't. Then when the B sample was tested with similar results, I accepted it and figured Floyd Landis was just like all the other people who you get behind just to find out they were pulling your leg all along. At that point, I just put the rider out of my mind and left it at that. Then I pick up this book. I'll tell you, he does a good job of planting doubt in your mind about the accuracy of the testing. He does give you reason to say, as I did, "Why would he be so stupid to do that? Why would he need to do that when he has shown that his comeback on that day was really not 'superhuman' but nothing different than what he had done before mixed with good race strategy?" The more enjoyable part of the book was the first half where he tells the story of his beginnings and growth in the sport. He portrays himself as anything but superhuman. He is just a regular kind of guy who had a dream to win the greatest bicycle race in the world. The second part of the book becomes a dossier for his legal defense - fascinating, but not enjoyable. You have to like Floyd Landis - at least his portrayal of himself - not only in this book, but in the way he has stood toe to toe with those who have brought the charges against him. From a purely PR standpoint, it is really the only option he has. I want to believe him. Just don't ask me if I do. I don't want to say I don't and lose the comfort in the thought that maybe he isn't. I don't want to say I do and then get slammed when I find that there is really incontrovertible evidence that he did. Joseph Wilson Bordeaux, 86, of Bladenboro, North Carolina died Friday, July 13, 2007 at his home. Mr. Bordeaux is survived by his wife of 65 years, Esther Pait Bordeaux; six children, Linda Pait and husband, Windell, of Bladenboro, NC; Jimmy and wife, Janice, of Yorktown, VA; Eddie and wife, Dreama, of Chapel Hill, NC; Deanna Lumsden and husband, Tom, of Newport News, VA; Donald and wife, Deborah, of Hampton, VA; and Timothy of Hampton, VA; a sister, Hazel Adams; twelve grandchildren and twenty great grandchildren. Mr. Bordeaux was predeceased by his parents, Lucy and Tillett Bordeaux, and 13 brothers and sisters. Mr. Bordeaux retired from Newport News Shipbuilding in 1983. He was a long-time deacon at Community Baptist Church. Visitation will be held from 6:00 until 8:00 PM Sunday, July 15, 2007 at Community Baptist Church, Bladenboro, NC. The funeral is planned for Monday, July 16,, 2007 at 2:00 PM at Community Baptist Church with Rev. Robert Ohlmann officiating. Burial will follow in the church cemetery. The family expresses its sincere appreciation to Community Hospice of Elizabethtown and requests that donations be sent to them in lieu of flowers. The addres is PO Box 3108, Elizabethtown, NC 28337. Yesterday I got up at around 7 a.m. to throw on my gear and head over to Sunshine Cycle Shop for the morning ride. It leaves out from the shop on Pleasantburg Drive at 7:45 a.m. and then heads back into some residential and industrial areas before winding through the "country." I try to make it every Saturday morning I can. This was the third ride I've made since being off the bike for over 10 days. My first ride back was a 25 miler through Cleveland Park. The second one was an over and back of Paris Mountain on Friday evening. Both were hard because I have not yet found my legs. Then, on just a few hours rest, I went out with the shop for what would end up being over 30 miles (including riding to and from the shop form my home). This morning, I am pretty sore! I'm including this map because there are two options for the ride. One option is a shorter route that covers just around 25 miles. This ride tacks on about 3 to 4 miles extra and includes a long gradual climb that gives you a good workout. This time out, I swore I wasn't going to push myself. However, there I was at the point of the first sprint leaving the group to go ahead and reel in a lone breakaway. I caught him and won the sprint - not on speed but with timing. I was feeling pretty good, so I thought maybe this would be a good ride. On the long hill I mentioned above I decided to try to take another sprint. The problem is, I haven't ridden this route enough to know where the line is! I got on the train and then near the crest of a portion of the hill, I dropped the group and took out over it. I then kind of slowed down thinking that was the sprint line. Well, there I was kind of taking it easy in the middle of the lane and I hear from behind, "Choose one side of the road or the other. Just don't ride in the middle." It was John one of the shop guys and a racer. Seems the sprint wasn't over! Embarrassed, I got back on the train and finished about fourth at the real sprint line - which is a gas station near the next intersection. I'm not sure John likes me. :-) It is hard for me to start a conversation with him and he has never had much nice to say to me. Not sure what I've done. I did apologize for being in the way and let him know I was still learning and wanted to learn. His only response was to repeat, "Just don't ride in the middle." Okay, I get the point. For the last six years or so, I have called him Opa. Before that he was Grandpa. Having children, they had to distinguish between their various grandparents, so my dad became Papa to my kids and Grandpa became Opa. The last time I saw Joseph Wilson Bordeaux, I was just ready to leave to come back to Greenville from visiting my home place. For years, he lived across the street from my parents with his wife, Esther. I can remember him driving his tractor a short distance to his garden to keep the weeds down. I can still hear his "pssshaw" when he wanted to express incredulity. Oh, there are a lot of things to recall! I had stopped by to see him earlier that Sunday morning and he was breathing with labored breath. He was unresponsive. I really thought I would leave that day never having an opportunity to tell him goodbye. I remember saying goodbye many times in the past because they used to live in Virginia where he worked in the Newport News shipyard. I remember his pride in having been a master welder on the first nuclear aircraft carrier "Enterprise." It was the same pride he took in his vegetables! We forgot something before we left that day. I had to stop by his house to pick it up before the 250 mile trip home. I decided to take one last look at him. There he was sitting up in the bed! Uncle Jimmy was there holding a cup for him to help clear the fluid that was building in his lungs. He was so weak. He could not talk, but he looked at me as I walked in. It was a tired look. What was going on his mind? It was his body that was failing. His mind was having some trouble with memory and he would recall many things from the past, but he had been able to communicate well enough. I wondered as I stood there if he would be able to understand me. "I love you, Grandpa," I said. I patted his leg. "I have to go, but I wanted to tell you that I love you." He could not speak, but he did not need to say words. His eyes turned to me and said what his words would have. How clear was his gaze. He let me know he understood and I could see he was saying goodbye. I walked backward out of the room still holding his gaze. I then turned and joined my family. The next Tuesday a week later he had his last moments before slipping into a coma - or deep sleep. Then today after I returned from a ride over the Paris Mountain, I received a call from my mother. She let me know that Grandpa - Opa - had passed away quietly shortly before 6 PM. It was not a surprise or a shock. In many ways it was a relief. I felt a great relief for him. He was ready to go. I believe he was only holding on for his family. Now his gaze sees the most amazing things! It is like I told my children this evening, he is not dead. Sure, his body is here, but that body is not what made Opa. The part that made him what he is and the part we loved is eternal. What a joy to know that future eternity is with God. We'll see you again, Grandpa. I have enjoyed using Wayfaring.com to map the rides that I take on my bike. One of the things that has kept me using the service is the way they allow you to post the maps in a blog. It is a nice and clean presentation. Wayfaring.com was sometimes hard to map. It takes a lot of time to create a map because you have follow each curve in the road. You also are only able to use the map information as a Web element. That is what got me looking for an alternative at first. I wanted something where I could create a course and then download the data into my GPS device. It sure would be nice to map out a ride on the Web so that I could have the directions in my Garmin Edge 305. Then, while reading Velonews.com earlier this week, I cam across MapMyRide.com. Wow, this is exactly what I am looking for! Not only does it allow you to create a map and download the course into your Edge, it also has a feature that allows you to follow a road when detailing the map. In other words, you can click on point A then go farther away on the map to click on point B and the script will draw a line that follows the road between the two points. A great time saver! The downside is that the presentation of the map in your blog is not as clean as the Wayfaring.com option. Still, it does work and going forward you will start to see rides appear in the MapMyRide.com format. Here is the map for the USACycling Pro Championships Time Trial course. It would be nice to ride, but that Hwy. 11 stretch could be interesting. I've always wanted to just head down that road, but traffic really flies. However, the rest of the course is on typical northern Greenville County roads -- which are wonderful road for cycling. The blue line shows one of the primary route for the 2007 USACycling Pro Championships Time Trial course. Click here to expand the map. Once you have expanded the map, click on it to be able to view more detail. The course will be 20 miles in length. It begins at the entrance of the Cliffs properties "Mountain View". There is a very short amount of Hwy. 11 before you turn left on River Road. There isn't another turn until you come to Old Highway 25 where the riders will turn left. Very shortly they will come up on Dividing Water Road - where the riders will take a right. Then it is a left turn back onto Hwy. 11 for a not so long section to the turn around point. After heading back on Hwy. 11 and turning right onto North Tigerville Road/Dividing Water Road and then left on Old Highway 25, the time trial contestants will stop backtracking by turning right onto Terry Creek Road. This will take them to a short loop behind the Cliffs properties Valley: right on Mountain Summit Road, right on Glenn Hollow Road, and right on Painter Creek Road. That will bring them to the finish. On the day that the riders of the Tour De France were making their first short ride in the French countryside to enter Belgium (there is some beautiful scenery in Belgium! ), the 2007 road race and time trial courses for the USA Pro Cycling Championships were announced here in Greenville. The road race will begin at 1 p.m. on September 2. The route is slightly modified from the 2006 course. It's total length is 110 miles made up of four circuits of a 22 mile main route with six shorter (just under 4 miles) loops of downtown and Cleveland Park. This means the riders will only have to cover Paris Mountain four times instead of five like they did in 2006. Want to ride the course? Well, you start at the intersection of Broad and Main St. Right there by the Greenville News and the Peace Center. Head west for about fifty yards and take a right on River Street. Take the next right on McBee and then follow the map above down to and through Cleveland Park back to the start/finish line. You'll need to do that loop three times before heading out on the main circuit. Ride the large route four times and then finish up with three more loops of the in town course. This is the same route that the riders of the Palmetto Peloton will be taking this year. We are supposed to go on the course and see how many laps we can complete before the pros come out. Looks like we may only have a couple of hours to get it in. I need to find out if they plan to have us do the start and finishing loops as well. My guess is we won't - but will stick with the primary 22 mile loop. That was some finish -- that is a true statement whether you are talking about the Pepsi 400 or the first stage of the Tour De France. Saturday's NASCAR race was weird. It was certainly not your typical restrictor plate race. Actually, I liked it. As for the Tour riding through the English countryside, it was great with Robbie McEwen coming from nowhere - from the back of the pack after going over the handlebars during a wreck - to blow everyone away on a final sprint. Wow! I really thought I was a goner when Stewart and Hamlin got mixed up. Stewart got out earlier than Hamlin and I was afraid his few laps would be the difference. Thankfully, I was wrong. Harvick had troubles and Shrub kept it off the wall. Gordon just did what Gordon does and I got the win. DraftingWithYates is starting to move up the field. There is now a three way tie for second place. He has really turned things around. It didn't hurt that he has the winning driver on his team. Watching the Tour made me miss being on my bike. What fun it would be to ride through the English countryside. I'll tell you though, those roads were pretty narrow! Today they cross the channel and will ride a pretty flat stage. The sprinters will rule again, though the winners of these stages will most likely not be the ones who will contend for the final podium. It's the mountains boys that will decide the winner. Here is one of my favorite group rides. The Sunshine Cycle Shop Hour of Power is a great ride - especially if you are a customer of the shop. I've been buying bikes and equipment there since the early 90s. I've only been joining the Saturday morning ride since August 2006. You can come along as well - customer or not. In the summers the group leaves from the shop at 7:45 a.m. Check out the Sunshine Cycle Shop website for more information. The blue line shows one of the primary routes used during the Hour of Power. Click here to expand the map. Once you have expanded the map, click on it to be able to view more detail. The ride breaks up into two groups about a third of the way through. The faster riders will continue through the whole course and the second, slower, group takes a short cut that sometimes brings the group back together toward the end of the ride. So, whether you are a beginner or a hammerhead, you'll find a group for you. The "Hour of Power" which is a bit more than an hour - it covers anywhere from 25 to 32 miles depending on which route is taken - concludes back at the shop where you'll find doughnuts, bananas, coffee, and sometimes some culinary surprises. Food or not, the participants often hang around the shop for up to an hour. What is the ride like? It starts off through some residential streets, along an industrial road that includes some nasty railroad crossings (hang on to your water bottles! ), and then you start making your way through the rolling countryside that you find below Paris Mountain. The hardest parts of the ride come toward the end. There is the infamous Nature Trail. This is a road that I hate. It isn't the steepest climb, but it just seems to go on forever! There is also the shorter but more steep Oakleaf Road. Once you are through those sections, it is a pretty easy shot back to the shop. You'll come back in on some of the same residential streets that you went out on. All in all, you'll find the fast groups pace to be around 16 to 17 mph - of course, on the sprints you'll be looking at the upper 20s. I've been in my house since Tuesday. I've been limited on what I'm allowed to do until next Tuesday. Today I was feeling pretty good and thought I would do some work around the house. That idea stopped when I tried to pick up a not so large item. I'm ready to get out though. I'm a home body, but it is starting to get to me. No riding - nothing - I'm getting tired of it. I'll miss the Sunshine Cycle Shop ride tomorrow morning. Though, I did have fun watching the rained out qualifying for the Pepsi 400 tomorrow. It is great to Gordon up front, but I really feel sorry for those guys that worked so hard to qualify up front to get in on time. NASCAR isn't the only racing tomorrow. Don't forget about the Tour de France! I'll be watching that tomorrow morning to see how the Discovery boys do. I'm glad Levi is with us this year - though I wish he could still be a Specialized rider. I liked him because he's got my hairline and rode the big S. At least he still has my hair line! I guess the title of this post should be "Riding with the Edge." I'm talking about the Garmin Edge 305. It is the cyclometer that has replaced my old combination cyclometer and heart rate monitor. The device is really quite neat. It combines a cycling computer with a heart rate monitor and GPS. All you have to do is snap it on your bike, acquire the satellites, and start riding. No wires or magnets needed. Of course, I got the 305 which has a cadence meter. You have a wireless device near your rear wheel that measures the revolutions of your wheel and pedals. Still, there are no wires and the look is very clean. What I like: I like the ability to have all my functions on one device. It allows me to have one less thing to worry about. The mount is solid and I'm not concerned about it falling off like my last heart rate monitor! I also enjoy all the data it gives. One thing my last HRM monitor did not do was tell me my max heart rate during a ride. I would have to keep an eye on it to get a sense of what it was. Now, I just hook the device to my computer (MAC or PC) and it will upload all kinds of info to either the desktop software or a number of online data recording sites. Currently, I am using MotionBased.com. Obviously, the biggest change with this device is the fact that it is GPS enabled. This means that when I ride, all the coordinates of that ride get stored in the Edge. When this data is transferred to my computer, it can be overlaid on Google maps and other GPS mapping software. I'm still learning how to make the most of this, but it is fun to play with. Rather than spending all my time now on the neat features, I'll start adding some as I ride. Unfortunately, that could be at least a week. Had to go to the doctor and he says that because of a procedure I had done, I will have to stay off the bike for at least a week. What I don't like: Granted, I don't know everything about the device yet, but there are really two things that pop out to me right away. One, the device does not appear to store the total miles ridden. It does have a history of your rides, but you have to clear those out at some point. Unless you are faithful uploading the data, you could lose your total seat time on the bike. So far I've logged 219 miles with the Edge. That brings my total on my Allez to 2912 since August 2006. I had figured I would hit 3000 before August 2007, and it is looking like that will be easy! Two, one of the things I thought would be really cool is the ability of the Edge to record elevation. 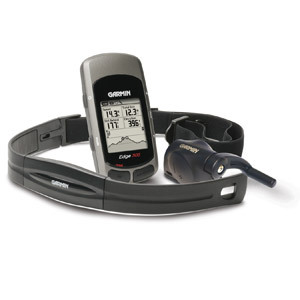 The device has both GPS and a barometric altimeter. This is supposed to mean that you get extra accurate elevation readings for your ride. Not so. I have not had a ride yet where the altimeter didn't go crazy on me. Fortunately, Motionbased.com has the elevation readings for most of the world. So, they will use the coordinates from the device and match it with their maps in order to correct the problem. Obviously, I'm not the only person with this issue. Had a great time at my parents' house last week. It is always good to get together with all my siblings and their families. I'm reminded how blessed I am to have this heritage. Basically, what we do is hole up down in the swamp. At times there are over 20 of us staying at the house. Last summer some of the family started building a bunkhouse. My dad finished it up and this was the first summer it was in use. Made for much better conditions in the main house! The cousins loved it. I did take my bike and rode nearly every day. Two of my nephews rode with me a couple of times. However, the big daddy was Friday, June 29th. That is a special day because it marked the completion of my first century ride. I started out planning to do a loop around a nearby lake -- Lake Wacamaw. However, as I neared the town of Bladenboro, I was a sign that read, "Supply 52." All I would have to do is jump on this road (NC Hwy 211) and ride it to Supply, turn around and come back. I could then say I completed my first century ride. The blue line shows the 100 mile route that runs out 50 miles and then back to the start. Click here to expand the map. Once you have expanded the map, click on it to be able to view more detail. I had plenty of water, some gel, and a power bar. It was around 9:40 in the morning and weather was good. I pointed my Allez toward Supply. The going was pretty good. I was averaging 20 mph without and trouble. As I looked ahead of me it appeared that I was climbing ever so slightly. This made me happy because I figured I would need some downhill coming back. Now, understand, when I say climbing, we're talking very shallow grades. This is a very swampy area, so the rises and falls aren't really that noticeable - at least when you are fresh. You can be surprised how hard it is when you are tired! The first 40 miles were really easy. This was well within my range. The next ten were not. Between the 30 and 50 mile marks, I entered the "Green Swamp" -- meaning I was on a long flat road with absolutely nothing around. It was right about this time I ran out of fluids. I had to decide to keep going through the swamp to Supply (which I figured was at least 10 miles beyond the 50 mile mark) or turn around and ride 15 miles or so to a gas station I had seen. I decided to turn back. I had no idea what was in Supply. I figured it was safer to stick with the known. By this time, it was starting to get rather warm. As I rode along, I started getting thirsty. This was not good. I even stopped sweatying as much. If I didn't get water soon, I was going to bonk. Thankfully, I made it back to the station and loaded up on fluids. I also got a bag of ice and filled my jersey pockets with the stuff along with my two extra bottles. Boy that felt good! Anyway, to make a long ride short, I came back to the area where I thought I had been climbing slightly. Now, it was obvious that I had been going downhill! Instead of being able to pedal with ease to the finish, I was going to have to climb. Oh boy. There isn't much to say after that. I had plenty of water, but by this time the sun was high and I could feel my arms begin to burn. My legs were telling me they had never taken me this far before. After five and a half hours on the road (5:11 in the saddle), I was near the finish. Honestly, with two miles to go, I felt like stopping and calling for my wife to come pick me up. I didn't, of course, and I can now say that I have completed my first century! Someday I'll do an official one, but at least now I know I can do it.